This article is about the 2013 French musical. For other uses, see Robin Hood (disambiguation). Robin des Bois (full title Robin des Bois: Ne renoncez jamais) is a French musical with mise en scène by Michel Laprise and text and music by Patrice Guirao and Lionel Florence. It premiered on 26 September 2013 at Palais des congrès de Paris and played until 5 January 2014[needs update] with French singer M. Pokora in the role of Robin Hood. 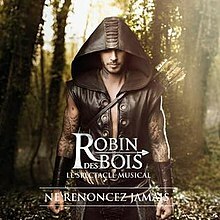 Robin des Bois soundtrack (longer title Robin des Bois - Ne Renoncez Jamais) for the musical Robin des Bois was released on Capitol Records / EMI on 22 March 2013 and entered the SNEP official French Albums Chart in its first week of release. The album is being released in two versions. The standard edition and the digipack limited edition. In September 2012, an initial single was launched titled "Un monde à changer" by Nyco Lilliu accompanied by a music video. In February 2013, a second single from the show was released titled "Le jour qui se rêve". 2012 "Un monde à changer"
"Le jour qui se rêve"
^ "Robin des Bois, la comédie musicale" [Robin Hood, the Musical]. Melty.fr (in French). Retrieved 3 November 2016. ^ Ultratop.be/fr/ Nyco Lilliu - "Un monde à changer"
This page was last edited on 30 November 2018, at 10:27 (UTC).